I am currently obsessed with gingerbread, a fairly new fascination that sprang forth on Sunday from I don’t know where. Hopefully, though, it will benefit you very soon. My more typical holiday obsessions are in full swing as well—including staring, transfixed, at our sweet, twinkling Christmas tree (which is a little crooked this year, making it all the more charming), watching all of my favorite holiday films (they are many) and unabashedly listening to such albums as Over the Rhine’s Snow Angels, George Winston’s December and Rosie Thomas’ A Very Rosie Christmas on repeat. As for non-holiday obsessions, my friends continue having the cutest babies on the planet. I’ve rediscovered my love for ribollita, which very well may be the perfect cozy winter weeknight dinner. More on that later. I am in love with my new top from Curator SF (where you could happily do a good amount of holiday shopping if you’d like!). And I just read Rob Bell’s novel, which you can download for free on his website, in less than 24 hours. It is amazing and made me cry like a baby, in the best way possible. But today, I’m just here to say hello, promise gingerbread and share with you an easy lunch or dinner option that’s healthful, full of flavor and festive in its own right. Another great option for these cookie-heavy December days! I mentioned a while back on Instagram my primary philosophy around spaghetti squash, which is that we ought not treat it like spaghetti, expecting the same result. This is bound to lead to disappointment. 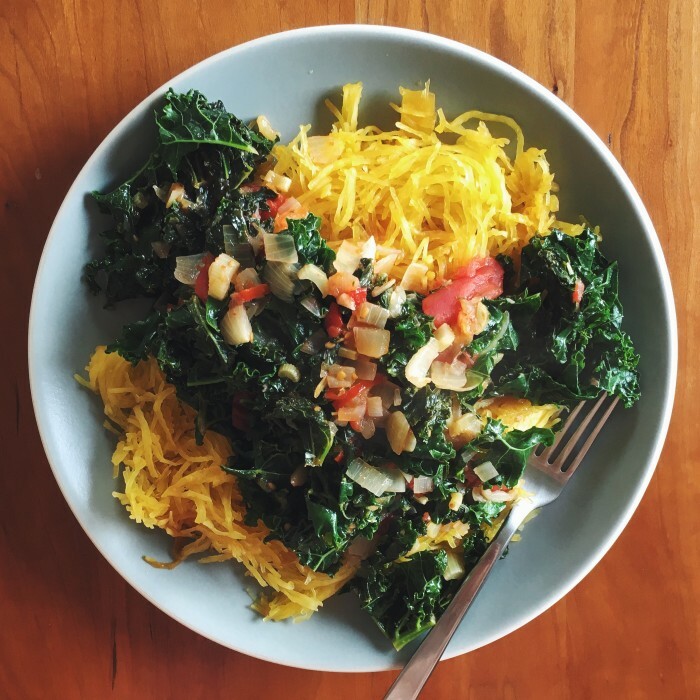 Spaghetti squash is a vegetable, not pasta. Delicious, but not delicious in the way that pasta is delicious. Thus, I suggest you treat it like what it is, which is squash: highly tasty but in need of a big kick of flavor to be truly enjoyable. On Instagram, this sparked a little flurry of comments, and so I thought it might be time to share a few more details. What follows is my usual method, a highly flexible template that uses the word “optional” more times than is appropriate in such a short block of text. This to say, adjust to suit the contents of your crisper drawer, your preferences and your whims! On days when I work at the shop starting in the mid-afternoon and on into the evening, I like to eat a big, early afternoon lunch that will carry me through. It has to be filling but not weight me down while I’m on my feet. This is just the thing. I can eat this whole recipe in one sitting, but you could also split it to feed two with something more alongside. Though they’re not pictured above, beans are a nice addition for a good dose of protein. I’ll always add them if I have some on hand. Broccoli rabe stands in well instead of or alongside the kale. And be sure to consider how saucy you want your sauce to be, adding tomato and water or broth accordingly. In my photo, there’s a bit less tomato and thus a thinner sauce than I usually prefer. Make a mirepoix, or as close to it as you can get with what you have on hand. First, warm a drizzle of olive oil over medium heat. Add the onion, celery and carrot. Cook for a few minutes, until the onion is translucent or nearly so. Add the garlic, a big pinch of salt and a pinch of red pepper flakes. Cook for a couple minutes more. Then, add a splash of white wine and allow it to reduce. Add the tomatoes and a big splash of their juices, as well as the beans, if using. With the back of a wooden spoon, roughly break up the tomatoes. Bring this mixture to a gentle simmer. Add the kale and preserved lemon, if using. Cover and allow to cook until the kale has wilted. Add more tomato juice or a splash of vegetable broth or water if you’d like your sauce more saucy, and adjust the seasoning. If you want the sauce to thicken further, lower the heat and continue cooking until it reaches the consistency you prefer. Just before turning off the heat, toss in some chopped parsley if it strikes your fancy. Serve a big pile of spaghetti squash with the sauce over top. Finish with more parsley, a small handful of pomegranate seeds if you’re so inclined and freshly cracked black pepper. You eat the most colorful food! OK, OK… I’ll try spaghetti squash again.